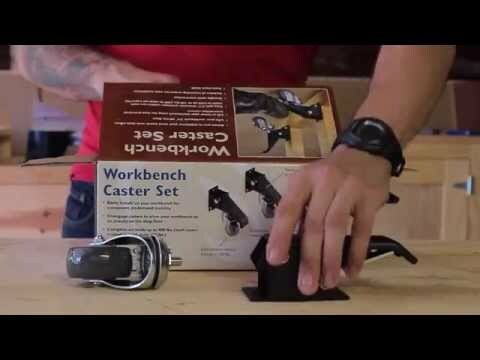 Maneuver your heavy workbench with ease using our Workbench Caster Set! This set of four easy-spin 2-3/8" urethane casters feature a foot-activated lift mechanism that engages or disengages with the touch of your toe. Engage them to lift your bench 3/4" off the floor for mobility, disengage them for stability. Each caster is constructed of durable steel and rated for 100 lbs. - that's 400 lbs. of total capacity with the 4-pc. set! Applications for any size shop on work space. The casters are sturdy and were easy to attach to my workbench. It’s nice to be able to easily move my bench out of the way when I need more space in my small workshop. These were easy to install, and they work like a charm. 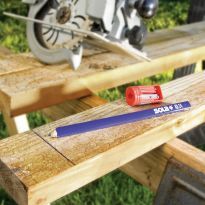 Work great for woodworking bench. Installation was a breeze. Paul Sellers has a good video for installation of similar product. They work exactly as advertised and what else could you ask for. I love these casters. I need more! They make moving my HUGE and HEAVY workbench very easy. Absolutely love these casters, I put them on a large workbench and it moves effortlessly around my workroom. I am a big fan of the wheel now that I am getting up there. these casters make my 300lb bench glide around my small home shop. 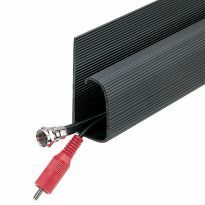 Easy to install, work great. They stay in down position while moving a bit over 200# work bench then stay up once you take the weight off and release. I've seen pictures of someone linking a side's worth of casters so both can be put down or up at the same time. Will do the same for convenience. Recommend. Cut the tabs off and welded directly to my welding bench. I might try linking them together with some square tube at some point. Bought these,on sale, long ago to use on a welded steel bench. Finally got the bench done and the casters work great. Was concerned that the overall weight might exceed the rated capacity or degrade the function but they worked without a hitch. Purchased early for upcoming work bench build due to sale price. 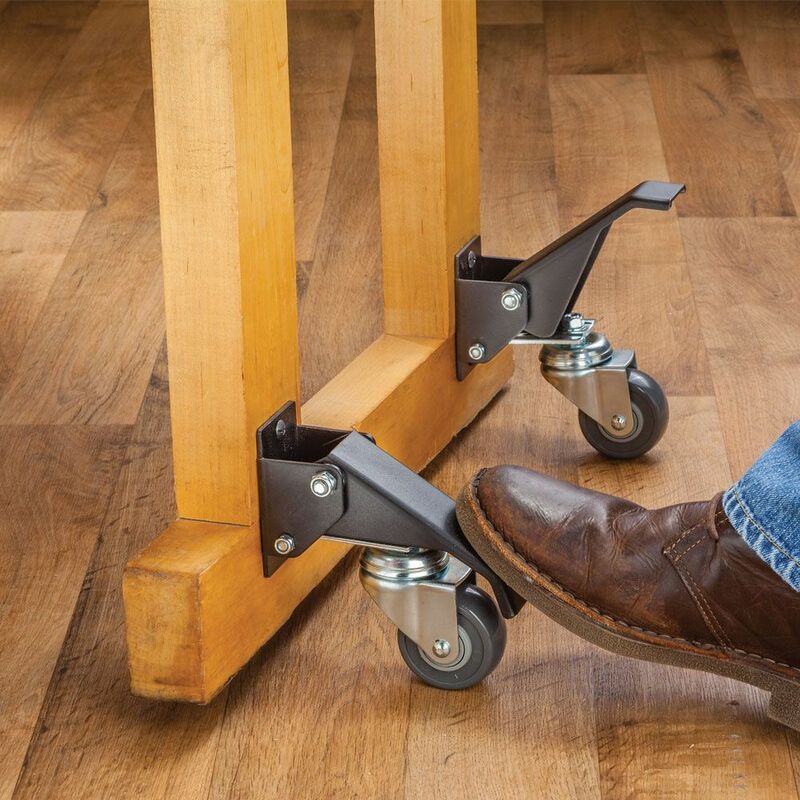 It is so easy to move around my table with these casters. 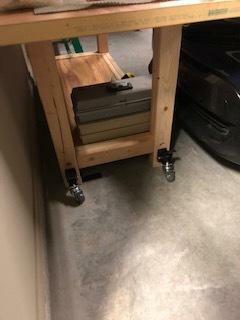 I needed my lathe stand to be mobile, and easy to tuck into a small space in my shop for storage. These wheels are awesome!! They all swivel for ease of movement, lift and reset easily,... and,.... the directions for installation extremely clear. Very pleased. 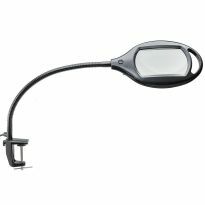 Easy mounting and great quality. Product works great. I would like different heads to the screws included. I stripped several trying to drive them into my bench legs. good wheel set and the locks work very simply. Don't interfere with the legs of the table they are on. I also bought the caster quick release. The wheels insert in the release very easily. You could buy a bunch of quick-releases for multiple work tables and only one set of wheels if you really wanted to. Then the wheels don't protrude into the work area; the only negative of any sort I have with these and other wheel sets. Perfect retracability for folding work table! Bought these for a folding leg work table I was building. I needed the mobility of casters, but also wanted the stability of rock solid table legs during use. 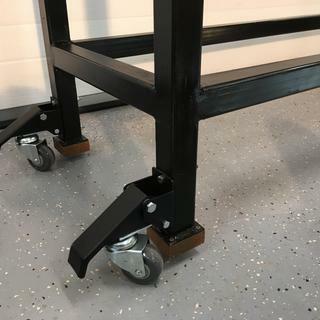 These casters really fit the task because they retract out of the way versus fixed casters which always have a single point, wobbly contact with ground. These are a SOLID alternative!! These work great with the Removable mounts. They will move a load. The Powermatic 3520b was a little heavy for them. I don’t move it very often so they will be good. Easy to install and work very well, recommended to all. I've added the caster kit to my miter saw table which I can roll to the position where I can use it. Before the casters, it sat in one place and it was inconvenient because I had to drag if from one location to the other. Now, I just push on the pedal and up goes the table so I can located it where I want it. It's great. Thanks Rockler. I love these casters! They work as advertised. Only thing I would request/change is that Rocker provide longer screws. Maybe provide both for those of us who want the screw to go through two 2x4's. These casters are great! Rocker needs to provide longer screws for these though. Really nice to move a heavy work bench with ease. Previously I had to drag my heavy workbench around my work area. It is not a problem anymore! The casters are great and with the clips I can remove them if needed. Well worh the $$ ! Great product, I will be buying more in the future! One change I would make is that it came with a torques or Allen head screw instead of Phillips. Other then that they look great! Bought these for my 8” Jointer. While probably at the upper end of the weight range, these work well to make this mobile for my small shop. I tied them together with 3/4” bar stock to make raising and lowering each end easier. Added casters to my “lifted” base for my Jointer. I have a Delta Unisaw on a mobile base, the elevating wheel on the mobile base has just never worked well (for 18 years). I saw these on one of April Wilkersons’ videos. With the sale price I thought I’d give them a try. The steering end of the Delta weighed in at 249#. The pair of casters when tied together is still able to handle the weight and the saw rolls around like never before...very happy! The other two in installed on my homemade shaper table and they work excellent. I added these retractable casters, rated at 100 lbs each, to a hard maple woodworking workbench I am building. 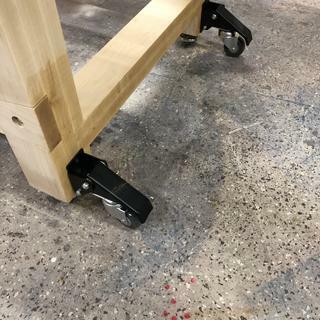 I estimate the weight of the workbench to be nearly three hundred pounds, and these casters make it easy to move around the shop with one hand. 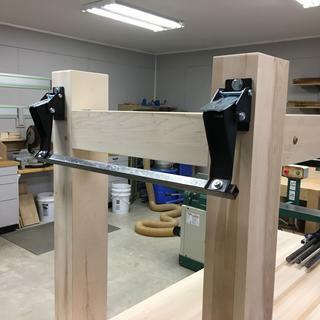 I connected the levers on each end of the bench together with a piece of 3/4" square steel tubing, so that each end of the bench will lift and lower as a unit. It was an easy modification to prevent racking the heavy workbench by actuating one caster at a time. These are great and Do Recommend these. I have them put on my Workbench to be able to use it in more than 1 application. Put these on a custom-made table for a very expensive 6 needle embroidery sewing machine. Combined them with four heavy duty lifting levelers to provide ease of movement and rock-solid stable base when not moving the machine. Excellent results, and far less expensive than $600+ commercially available tables! Exactly what is needed for mobile assembly table. Suggest maybe offering a complete set with these casters, mounting bracket, and leveling plates. The caster work as advertised. They were easy to install. 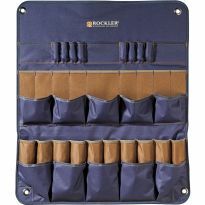 But it seems like every time I buy something from rockler the item goes on sale in a month. Go figure. My work bench is close to capacity for this item, but they work extremely well. Glad I added the wheels. Need to move something big & heavy? This is it. I store wood on my porch of my shop. Wanted to bring unit inside to put all of my wood on it. 2W x 8L x 7T, four shelves. Thing is big & heavy, holds a lot of wood. Moved it with a tractor 17 years ago. Live in the country. All the city boys don’t want to come out & help me. Even though I help them, too much. Bought this. Took an hour or so to install. Worked great. Will get some quick release plates later for other equipment! Works well as advertised. Easy to install. I wish I got these when I got the bench 10 years ago. Makes jobs easier when moving around the shop and they work with very little effort! Need to move a Band saw around without torquing the blade set. I've used them before and are very satisfied with their quality. 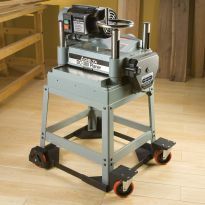 Need for a new mobile base I built for a new table saw. 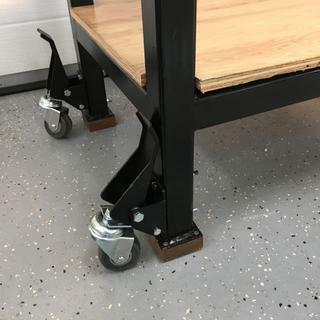 I have a small shop and these casters would make it easier to move the workbench when more space is needed for a project. My large power tools are all on casters but I have two large heavy workbenches that are not currently mobile. With these casters and a couple of sets of the quick-release plates I can move as needed and remove the casters once done. 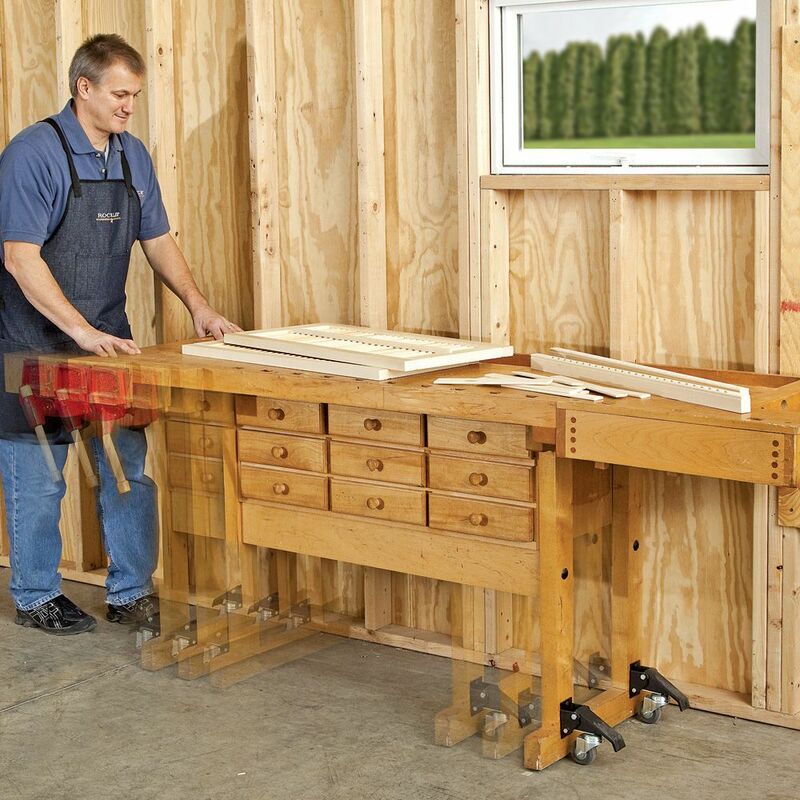 I need to build a workbench with the ability to be moved around the shop. On sale is pretty cool too. To make my routher table portable. Have a set... they work. Will add cross bar as others have done to lift or release one end of my bench not just one corner. This will enable me to move the workbench for cleaning, etc. Have to try one set to see about ordering other sets. 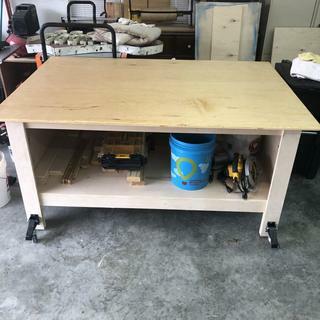 I'm planning on building a new workbench and I want to be able to move it around for more flexibility in my shop. They are a present to my son I have them in my shop and they work great. New wood working bench at the house. I just installed a set of these on my woodworker's bench and I loved them so much I realized my router table needed a set, too. To make my work bench more portable. I saw these on "Get Hands Dirty" Youtube channel - they look like just the thing for my table saw. 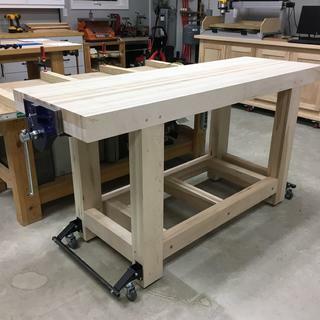 Heavy duty application to make bench or cabinet mobile. To place on my workbench. Creating a base for my drill press and band saw and need it to be mobile. 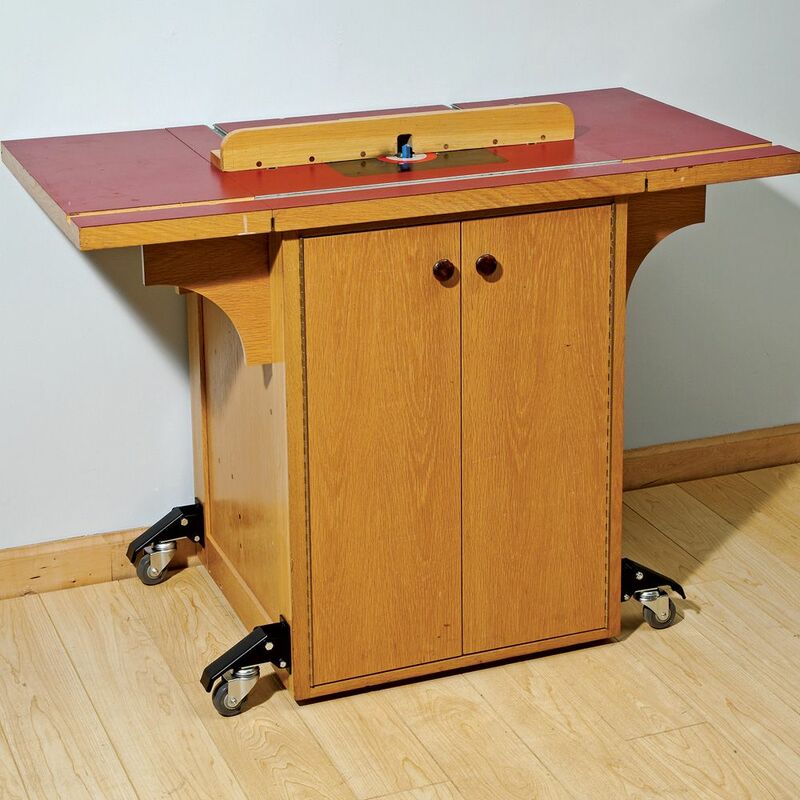 This completes having a set of casters in each location - home, shop and work. 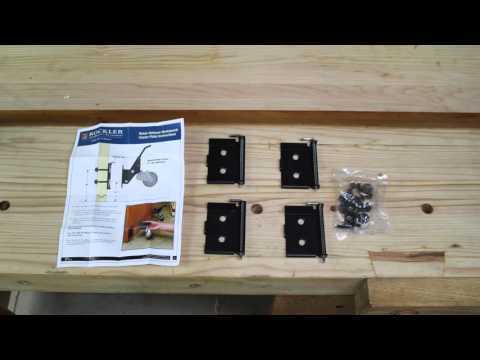 saw demo on you tube concerning the building of a work bench. Very simple to install and they work perfectly every time. Saw it in a project on YouTube and it is exactly what I need. Recommended by on line woodworkers. Only good option for workbench trestles. I built a tall bench for my Shop Smith system which also stores all the heavy accessories. It weighs a few hundred pounds which makes it difficult to move without removing all the accessories, These will really help allow moving the bench. Building a mobile kitchen island, only needed 2 :-( , the other two casters are non-swivel. Guess I'll need to build something else :-). Does anybody have any experience with the "tires" separating from the "rim"? Mine started to desolve in a million pieces, without having been overloaded or rolled through any type of chemicals. BEST ANSWER: Purchased a set for a bench at work in a chemical plant, have had them in use at least 4 years with no problems. when I have need of this type of caster on other portable equipment and tables I buy these have 4 or 5 sets now with no trouble. So far so good for mine - they have been on the work bench for about 2 months. I installed these on a workbench that also stores many of my hand tools so the weight must be a few hundred pounds. They fell apart within days so the casters are really only for light weight duty. I replaced them with 3" casters rated at 250 pounds each but it did require redialing the mounting holes to a larger size. All seems to work now so I think the step lift mechanism is up to the job. bought this set a few years ago put on my work bench , moved it and raised the wheels, went to move recently and two of the wheels split at the seam and came apart. I found some casters @ Tractor Supply that are close in size. I have also had 2 tires break apart and am looking now to replace them with something more durable. The size is a little more difficult to find but I am looking. Try caster world. They have heavy duty casters. My tires also disintegrated after a few years in my shop. Looking for replacement wheels, but it does not look like Rockler sells them. Mine are holding up great. Maybe you got a defective tire. Can I get Technical specifications for this? I want to know the size of the mounting plate and the "screw holes". I'm a draftsman for theatre and I'm specing these for a piece of rehearsal scenery, but I need to know where to drill bolt holes and how/where I should place framing to support the casters. BEST ANSWER: Plate Dim(X,Y) - (1.965in, 3.558in). 2 mounting holes, one centered at top and one centered at bottom, coordinate to follow. Coordinates(X,Y), reference pt is top left corner, (1.033in, 0.486in). Hole Dia(in) ~5/32 to 11/64. Top hole is at 4-3/4" from floor and bottom is at 2" high. 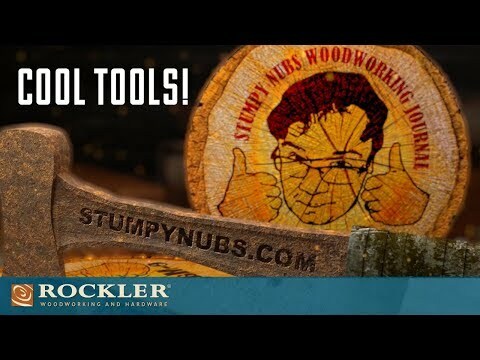 Go to Rockler web site and down load install instruction for info. Can I replace the 2-3/8" urethane casters with pneumatic casters? I need this to be able to roll outside easily. BEST ANSWER: I believe you could do this I find the casters from rockler to be just fine , when I pull my saw out of the garage onto asphalet driveway, no problems. I don't really have the answer for that modification but I think at least a 4" diameter would be more important than softness. Good luck. The bracket has a hole where the caster bolts on to, so technically you can change out the casters. You have to consider that if you change the size of the tire or are using a pneumatic tire account for the change in mounting height of the bracket. On a side note, I have my mine mounted on a workbench that i roll out from my garage onto a paver driveway and it isn't smooth like a pneumatic tire might be but it gets done. Hope this helps. yes and they work good. They are also on sale. 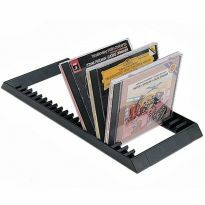 Does anyone know of similar hardware that allows attachment to a horizontal member, say a 2 by X piece? I used a piece of 1” steel round stock. These have a working load of 100 lbs. each, correct? So a 400 lb bench could be supported by 4? Is there anything that might have a larger working load? BEST ANSWER: It does have a load rating of 100 lbs per caster or 400 lbs with all four. However, when you raise the workbench off the floor to a rolling position, you are putting all 400 lbs on the first caster you raise. For me, this was enough to cause the caster to fail and my workbench only weighs about 250 lbs. I would use a heavy-duty locking caster rated for more weight if I were you. I will be switching out my casters this summer. This set of work bench casters should do the job moving a 400 lb bench. I do not know where you can find casters that will carry a heaver load. I want to mount these on the inside of the legs. I trip over enough stuff now as it is! I have exactly 6 inches from the floor to the underside of the crosspiece on my workbench. I know that is enough space to mount these. But will 6 inches allow the lift mechanism to come up high enough to engage the wheels? Will it be a real pain to 'step on' that lift mechanism, trying to slide my foot on there with only 6 inches clearance? BEST ANSWER: You need to get the mounting plates set. Than you will be able to remove and replace the casters at will. I had the same problem, the casters lock into place on the plates. Steve- It's not very likely that this mounting arrangement will work. When the wheels are retracted, the wheel engagement lever flips up well above the caster mounting, probably already very close to 6 inches from the floor. With your foot thickness at about 2 inches, I really doubt that you'd be able to depress the lift mechanism if you mount them on the inside of the legs with your crosspiece. Can I mount these on the inside of the bench to keep from tripping over them? BEST ANSWER: I don't see why not. The only issue I see is getting at the lever to raise and lower the casters. it can require a lot of pressure to operate the level if you have a heavy bench. As long as you mount them so that they don't conflict you can put them on any side you want (i.e. don't put one pair on a side and the other pair on the end - you have to do end/end or side/side so that it will roll together. That said, I'm not happy with mine... the casters are just too small unless you have a perfectly smooth floor. One thing I should note is that they extend about 4" out from what they are mounted on so your base could be pretty narrow if you mount them on the inside. You'll want to make sure this doesn't cause it to be unstable. You'll also want to make sure you can get to them to lift/lower the wheels. 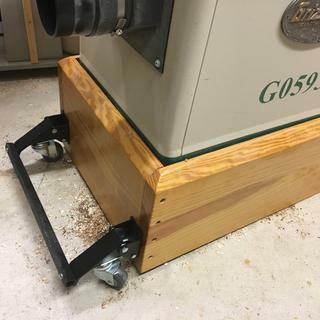 My garage floor is so unlevel, to get out feed table level with table saw there is a 1 3/4" gap from bottom of bench to floor on 1 side and 1" gap on other side (currently using leg levelers). Will these still work to lift out feed table of leg levers and roll around? BEST ANSWER: They lift about 3/4" -- my floor is also uneven, so once I put my workbench in place, I sometimes need a wedge to level it. You could also use adjustable feet but it was recommended to me not to use them on a a work bench because of the pounding it might take. What material are the wheels made out of? BEST ANSWER: The wheels are made of urethane, as mentioned in the description. I have not been using these long, but I just installed them on a work bench, and the seem to work fine. I don't intend to move the bench all that often so I hope they will wear well. Castor wheels seem to be made of the same material as inline skates. Very durable. Would these survive being stored outdoors in the weather? We need an outdoors mobile ramp on the blacktop that can be set solidly down after locating. BEST ANSWER: I have had these attached to an outdoor work bench for two years now and have had no issues. I am in Los Angeles though and we don't have very extreme weather. Yes. I have used them outdoors in AZ dice o purchased them for a set of movable stairs. They work great and numerous neighbors have purchased them. Get much rain in AZ? Only during the summer monsoons. Yes. 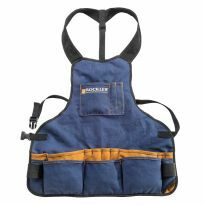 They are well made & very heavy duty. I would definitely buy again. Would it be possible to attached these to the bottom of a table saw that has metal legs? 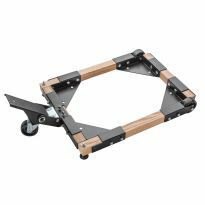 Looking to use casters to make my table saw mobile. Jet 708492K model. BEST ANSWER: Yes, you can. I just did it. If the legs are not vertical you may need some angle spacer blocks (I just did it), then drill holes into the blocks, then into the legs. I used bolts, of two different lengths, to attach mine. Works like a champ! I think it would work because the Jet saw has vertical legs. drilling holes and attaching with bolt works fine. It would be difficult to attach them directly to the metal legs. You could build a 2x4 frame , attach the legs to that and the casters to the vertical sides of the 2x4s. Better option would to be to buy a base designed to be used with a table saw from Rockler or another source such as Sears. 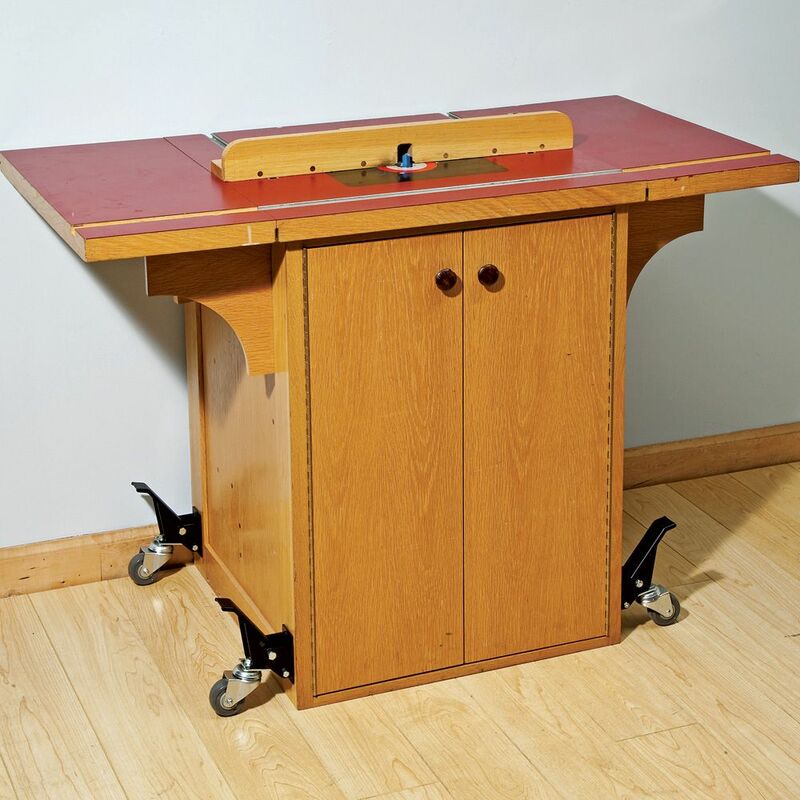 my work bench is made out of an old bowling lane It weighs about 200 lbs will these casters support it?? BEST ANSWER: Yes, I would also get the removable acssesory, so when you get your work bench where you want you can take the caster off and your not stub your toes on them, make shure you attach them a solid place on your bench. I think they will. My work bench is over 150lbs and they have no problem with it. Just make sure you use bolts and nuts and not just heavy duty wood screws. 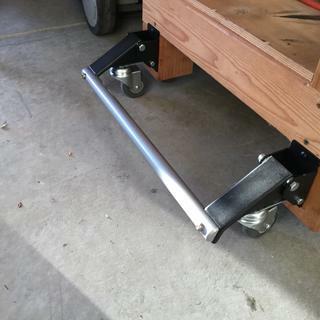 Yes, they are great being able to move your bench around, they work great in my garage, I can move the bench against a wall and make room for my car. 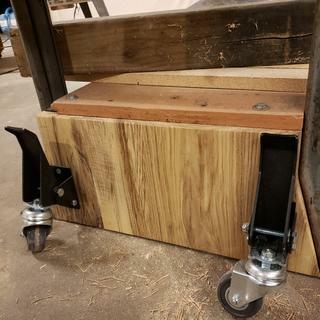 I have a set of these casters and they lift my 300 pound sjobergs workbench just fine. But when it comes time to lower the bench back to the floor, I have to use a Fastcap jack to flip them up. I can't do it with steel-toed boots, It would be nice if there were a way to softly lower the bench, so its weight doesn't cause it to slam down to the floor once the "flipper" is disengaged. Does anyone else have this problem or a solution? BEST ANSWER: Yes they require quite a lot of pressure to disengage but I made me a release rod out of 3/8 inch rod with a T handle and hook that does it fairly ease while standing. Mine are on a 400lb. work bench. Makes a little ruchus though. So is it 100lbs per caster or in total for all 4? I have a 300+ Lbs desk that I want to mount these casters to. The desk is heavy and is made of particle board. Not to mention I will be also adding tools on to the desk as well making the weight significantly greater. For my solution can someone suggest another product if these casters dont work please? My side panels are 1 1/4" wide and I haven't found any u shaped brackets with casters to work. BEST ANSWER: You can always modify your table and make your own set of lifting casters. Norm Abram has a video on a modern assembly table for New Yankee Workshop that goes over how to do it. I would suggest beefing up the areas where the casters are going to attach. 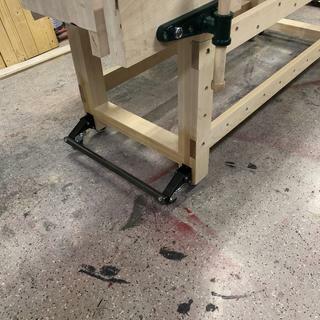 I have has trouble using the casters in 3/4 in baltic birch plywood and had to double the thickness to make the casters works. It shouldn't be a problem. They are pretty substantial. I use them on my work bench, although it doesn't weigh 300 lbs. do these castors work with the Rockler 24'' x 36'' Shop Stand Item #: 48089 ? BEST ANSWER: You might have to drill holes in the legs for these. I've used the casters with the threaded studs that mount to the bottom of each leg. These are the ones that I've used on 7 stands. What is the width of the caster wheels? I assume the wheel dimension of 2 3/8 is a diameter? BEST ANSWER: I bought my casters in December of 2017 and measured one of the wheels for yo. It's 1-1/16" wide (wheel only). Can I use 4" casters instead of the supplied 2 3/8" ones? I need to move and lift a 200lb electric piano off the ground and maneuver it to gigs. Are these suitable for a 10" Rockwell Unisaw and extension table? Or are they too meek? 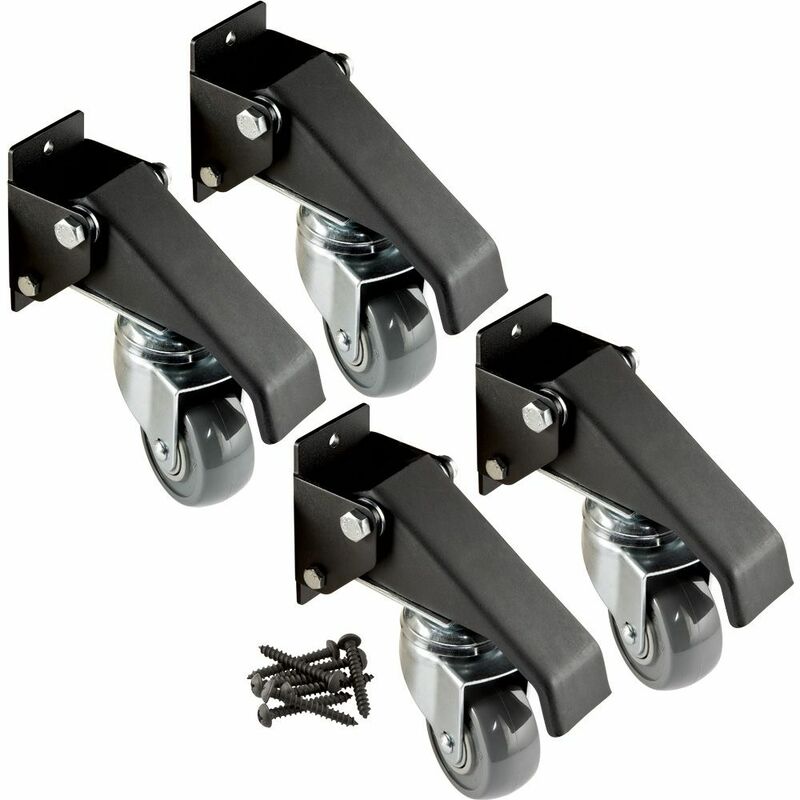 BEST ANSWER: These casters have a load rating of 100 lbs each, with a total load rating of 400 lbs for the set. If your Unisaw is within that limit you're ok - check with Rockwell to be sure if you don't know your saw wt. That said, these casters are heavy duty and well made. I have them on my work bench which is made out of a 3" thick maple top, 24" x 72". It's pretty heavy but not 400 lbs. I have them on a very sturdy workbench made of 4x4 fir posts with a 2x6 frame and 1" table top. I also keep my heavy planner stored on the lower shelf. Not sure of the weight but very heavy for me to lift. Hope this helps. I put them on an old Sears 10" table saw with a cast iron frame. They seem to be sturdier than the saw legs. i believe they will serve you well. I used mine for a cabinet that has a 12" planer and a 6" jointer. I have a set of these on a workbench that weighs at least 250 pounds. They work great. I just purchased a Powermatic pm 1000 table saw. I'd like to use the Rockler workbench casters to make this saw mobile. 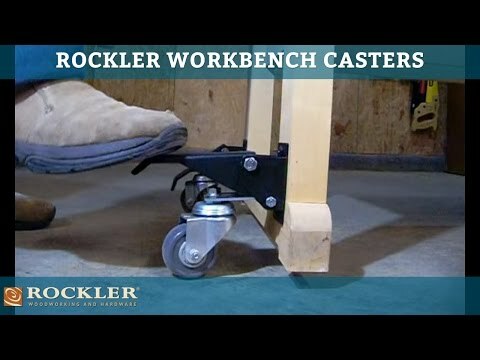 Are the casters heavy duty enough for the job? BEST ANSWER: I built a large heavy wooden workbench with storage underneath for tools & equipment which I estimate weighs in at least 300 pounds in total. These casters make it very easy to move anywhere in the shop and I've had no problem with them. The maximum weight for the casters is 100 pounds each for a total weight of 400 pounds. The Saw you purchased weighs less than 400 lb's. I have the same set of casters on my out feed table that work well. Probably, however I had some larger casters that I used on the brackets by modifying the brackets to fit the larger casters. It took some planning but they work just fine. Absolutely. 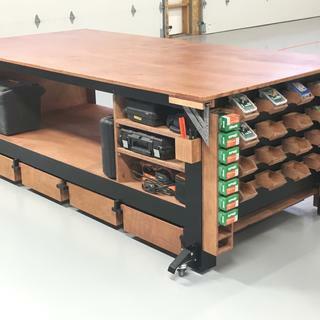 I have them on all my equipment as well are my two work benches that are well over 200 lbs with all of the extra drawers I've built under the table top. Yes they are very heavy duty but difficult to engage under heavy loads. Therefore I tend to leave them up to avoid the struggle. Hope that helps. what is the width of the bracket - or what is the minimum width of the table legs? 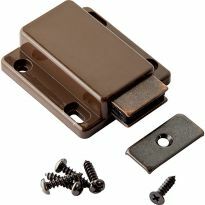 BEST ANSWER: The part of the bracket that rests on the leg is 49mm wide. The "arms" that extend out add a few millimeters on each side, but, again, the part on the leg is only 49mm wide. If you don't mind the bracket extending out past the leg, the screw holes are centered on the bracket, so you can actually get away with a much smaller leg if needed. The width of the bracket is 2 inches with one hole centered at top and bottom. The height is about 3 inches. A 2" leg would be a minimum, although it might work slimmer but would extend on the sides. did not use them yet.. so I don't know. I have an old craftsman cast iron table saw on a steel base. Think this would be able to hold the weight of the table saw? I have no idea how much it weighs. BEST ANSWER: I have two sets of these casters, one set for a workbench I made that weighs 350-400 lbs much heavier than a saw even with a cast iron top. And the other I've used for a cabinet that holds many different portable tools the top of which holds my planer. The casters work great for both of these uses. This should work just fine. My casters support my 8’x4’ wood workbench that is loaded with power tools and paint. I’ve never had any issues with caster performance. I have these on a 2x4 bench that is 8'x2' with a Ridgid planer and they perform perfectly. I do not think you will have any issues. I have a nine foot Sjobergs bench that weighs 300 pounds. Would you recommend these for occasional use? I believe this product will handle it, the ones I have are preforming well. How far do they stick out from the workbench leg? Not far, maybe an inch or so. Not sure why you ask, but this small distance created aroblem for me when I attempted to install them on my Czech Aviya workbench. On this model, the bench legs are resessed from the feet edges, thus installing these wheels on the legs meant that the wheels rested on the feet when lowered, hence were useless. However, the fix is rather easy....just install a wooden spacer of the needed thickness on the leg and then mount the wheel on this. 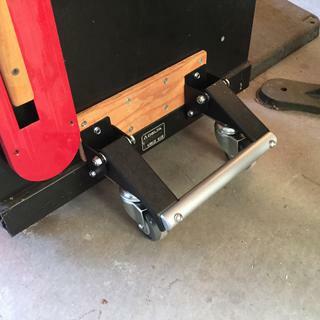 How can I keep the casters from rolling under the legs? When engaging they will, sometimes, go underneath the workbench legs. BEST ANSWER: Good Question! I have had problems with this myself. To alleviate some of the problem, I installed the wheel brackets 1/2" higher on the leg than the instructions indicate. 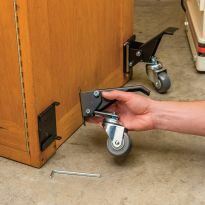 This still gives you 1/2" clearance under the legs when the wheels are locked and stops the wheels from curling under in most rolling situations. As soon as you lift up on the workbench, though, the wheels still try to roll under. Thanks, Bill. I installed mine 1/4" higher for a little better leverage. I am going to see about fashioning a block to place on the leg just below the caster in hopes that can keep it from rolling under. Other than that I'm very pleased with the strength and glide of them. I have your steel router base. can I put these caster wheels on it? BEST ANSWER: I have these castors mounted on my contractor Jet table saw. Thus far they have worked well. I had to drill extra holes and use carriage bolts with lock washers. Seems to work fine. I will be watching carefully for any excess wheel wear. I would hope that it was a case of one defective set of rubbers. It should be possible but you will need different hardware. The casters come with wood screws. Just drill holes in the base and install bolts. I installed mint on a woodtek jointer base. what is distance from bottom of bench 'leg' to bottom of bracket? BEST ANSWER: The bottom mounting hole is 2" above the ground and the top hole is another 2-3/4" above that. Are these anti static or chemical resistant? I want to use them for a cleanroom. BEST ANSWER: Wheels are a hard plastic rubber composition. They do pick up dust from the floor. Prob chemical resistant but couldn't say about anti static. Can I mount these just a little higher than what the instructions say? Probably about 1/2" higher is what I had in mind. i have mounted them so that on a couple of my benches they only clear the floor a very little when engaged...you'll have to experiment to see what works best for you. I don't think I'd mount them higher than recommended unless you do some very careful measurements. They only lift the workbench just enough to be able to roll it around my shop so if you go too high they might not provide enough lift to get it off the floor. To make a long story short, I can't easily set the lower edge of the bracket lower than 1.75" off the floor. Do you know how that stacks up to the instructions? Sorry, I installed mine a couple of years ago and I can't remember.